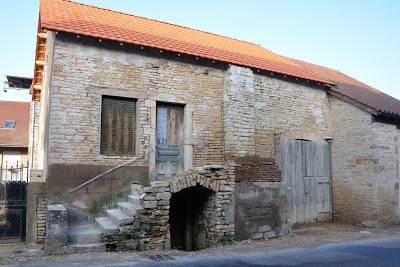 Eduard van Boxtel, the moving spirit behind Le site sur l'Art Roman en Bourgogne manages a database with buildings that are or might be Romanesque, but not all these building can be found on his website. Is that tiny window high up a maybe a church window? "Confrançon is also a question mark. I do not have a picture, but it has been described in the list of Alain Guerreau which I passed on to you earlier. He says :'it is a chapel comparable to Ougy, Chapelle', but I can't believe that. It is possibly a former church, now habitat. Maybe you can do something with this information?" Until I was looking on the internet, in search of a completely different church. There I stumbled on the site Observatoire du Patrimoine Religieux, which mentioned quite a few churches of which the only entry I knew of came from van Boxtel. And Confrançon was mentioned here as well, making it more likely that we simply had missed this church. We had investigated all the gardens and buildings in Confrançon, except for the last couple of houses along the D14 direction Cortevaix, when Sue literally at the one but last house in the top of the gable spotted a small window with what could well be a statue of the Virgin Mary, and when I, coming from the other side in the other gable spotted a bigger window opening with a round arch and a square window. Had we struck gold? 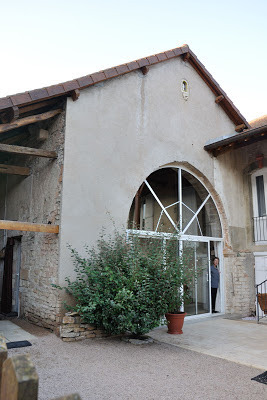 When I looked at the facade Sue had found, I saw another big door opening, also with a round arch. And while I was taking pictures, the owner came out, asking what we were looking for. She was curious and possibly a bit worried as well. 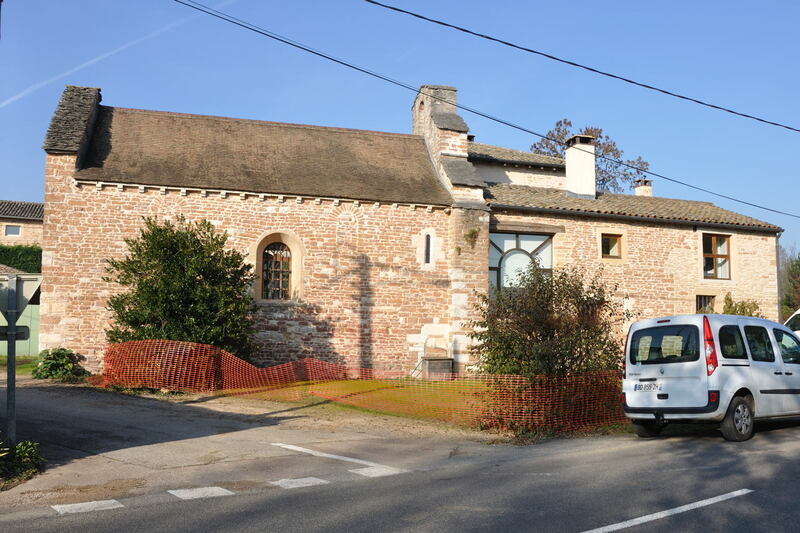 However, when we told her that we were looking for the church of Confrançon, she confirmed that this was the former church. 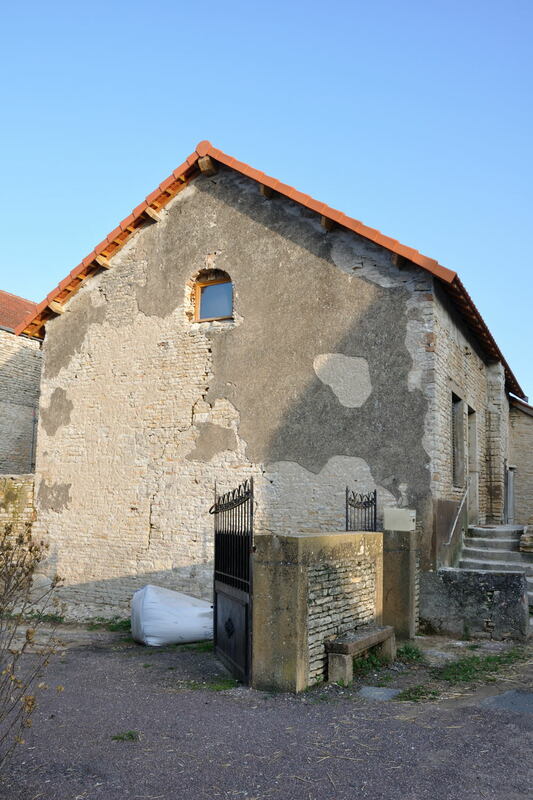 She had bought half the church, her neighbour owned the other half. 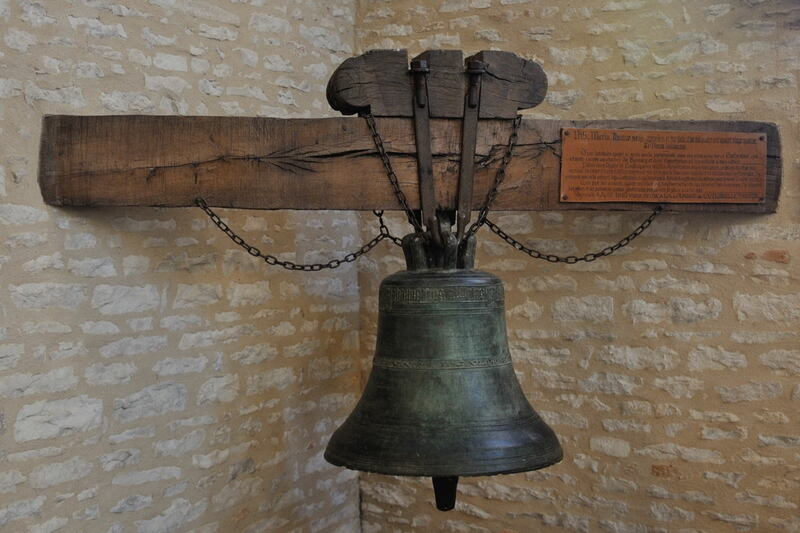 She also told us that the old church bell was now displayed in the church of Cortevaix. Who would still like to deny that slow and steady wins the race? 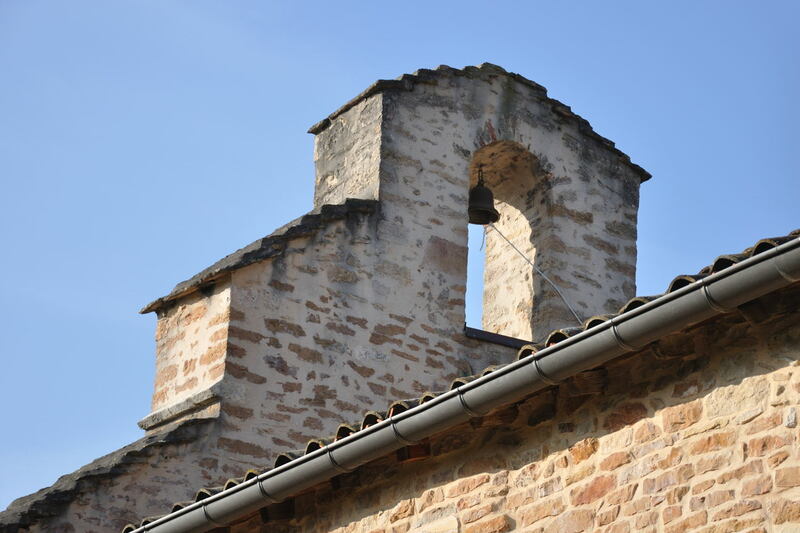 After having been to a food fair (I must say, it sounds better in French: Marché des Plaisirs Gourmands) in Mâcon we decided to visit a church in that corner; indeed the church (not) described two blogs ago, the Saint-Denis in Saint-Maurice-de-Satonnay. It was going to be the first but certainly not the last time we found that door closed. Between Mâcon and Saint-Maurice-de-Satonnay we drove through the hamlet Les Renauds in the commune of Charbonnières, near Mâcon's golf court. 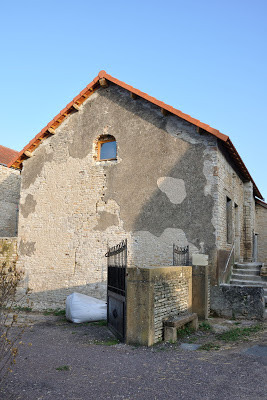 In this village we found, along the road side, a residence of which one half still strongly resembled a church or chapel. 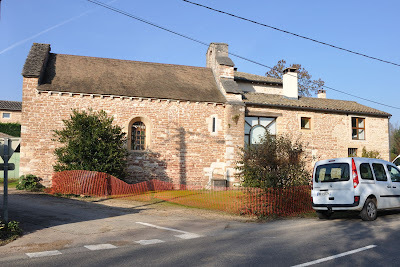 This happened to be, and I quote Wikipedia, maybe not the oldest, but certainly one of the oldest still existing Romanesque chapels in Burgundy, dedicated to Saint-Benoît. Wikipedia mentions the year 960, just after the construction of Cluny abbey. The chapel has a bell-gable like one sees often in the south of France, a clocher à peigne. During this trip we did not find what we were looking for, but at least we had found something else, and something unexpected. When you are the owner of a registered monument, you have the obligation to open your property to the public. You are however, allowed to ask for an entrance fee, and you are more or less free to determine the opening dates and times. For example, the remains of the oldest existing church in Cluny, the Saint-Odilon, are inside someone's residence. In the past, the owner possibly had applied for a subsidy for a restauration, and opens her entrance hall, where a few columns, capitals and arches can be seen, to the public on the two European Heritage Days per year, at a modest entrance fee of 1 or 2 € per person. 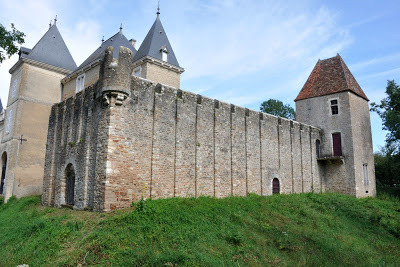 In La Chapelle-de-Bragny the castle is privately owned, and within the castle walls one finds a fortified chapel. The set-up is not dissimilar to that of Bezorney (see previous blog). 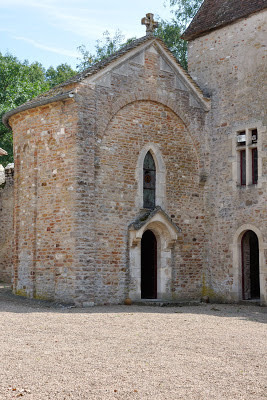 La Chapelle-de-Bragny also once was a doyenné of the abbey of Cluny. This château has very restricted opening periods. Château as well as church or chapel are open in the afternoon from 1-14 July and from 1-30 September, at a fee of 4 € per person. In my innocence I assumed that the village was named after the chapel, but that is not the case. 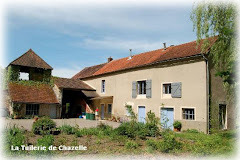 The Lords of Bragny had as a family name de la Chapelle, and that is where the place name comes from. 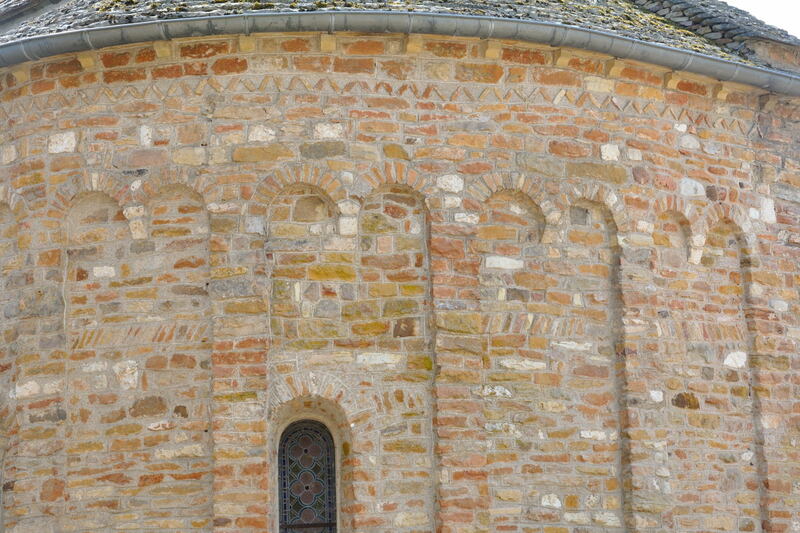 The church is a beautiful example of early Romanesque architecture. Most likely the church, of which only the apse still stands, was built by a Lombard master builder. Characteristic are the Lombard bands inside and outside, and the "frise de dents d'engrenage" (saw tooth frieze, my own translation). During the middle ages there were quite some conflicts between the various Lords, such as the Lords de la Chapelle and the Lords d'Huxelles-Brancion, and in that period the church was fortified to protect the villagers once the Lords were feuding again. Anyway, our local paper (Le Journal de Saône-et-Loire) publishes every Friday a supplement with all the exhibitions, festivities etc. in the area for the coming week. Ironically this supplement is called Samedi & Cie, dating back to the time when it was indeed published on Saturday. We buy the newspaper every Friday, and that is the reason I found out when the chapel and castle were temporarily opened to the public. And I certainly did not regret heeding that call! For a few more pictures of castle and chapel, click here.